GARDENS BY THE BAY Over the weekend boyfriend's brother and his fiancee were having their night shots taken at Gardens by the Bay for their upcoming wedding - congratulations!! - and so both of us decided to join in the fun too! The last time we went there we were a little down on luck because the lights were suddenly down and we had to miss the night show. Therefore we are back for a second time. The first time I saw this romper was on Desiree's blog, it was so chic that I went searching high and low for it for a couple of months haha. Then my cousin happened to ask me to join her online spree during the chinese new year period and that's when I managed to come by a similar piece. 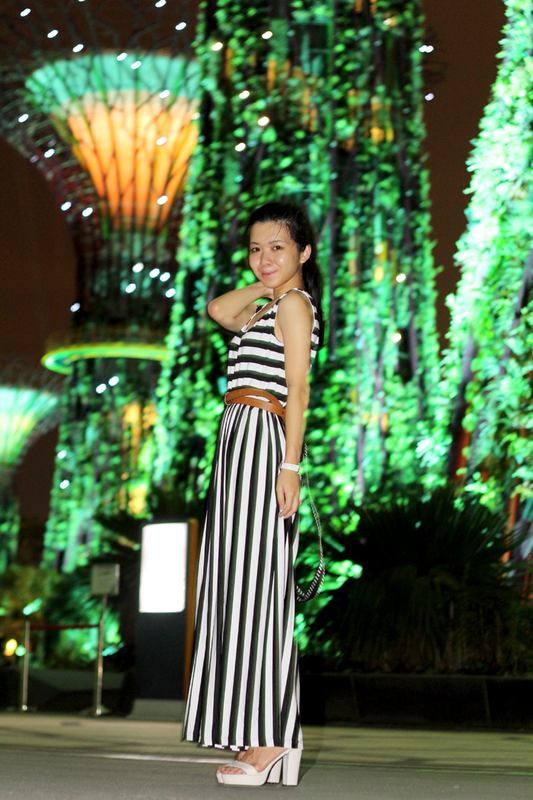 Main reason why I love this romper is because of the stripes - they visually elongates my legs so much! The romper look kind of to begin with, therefore I went sans-accessories with nothing but a simple white leather watch. But ahhh - I think I forgotten to put on make up that night too haha! This post isn't really an outfit post, as quite a bit of photos didn't came out quite well. 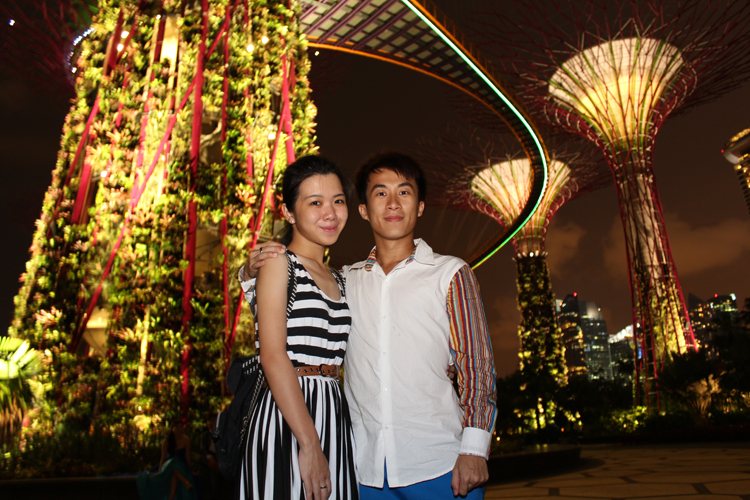 But there are lots of pictures of the sparkling lights at Gardens by the Bay. You just gotta visit this place some time during the night! This was one of the few behind-the-scenes shot! 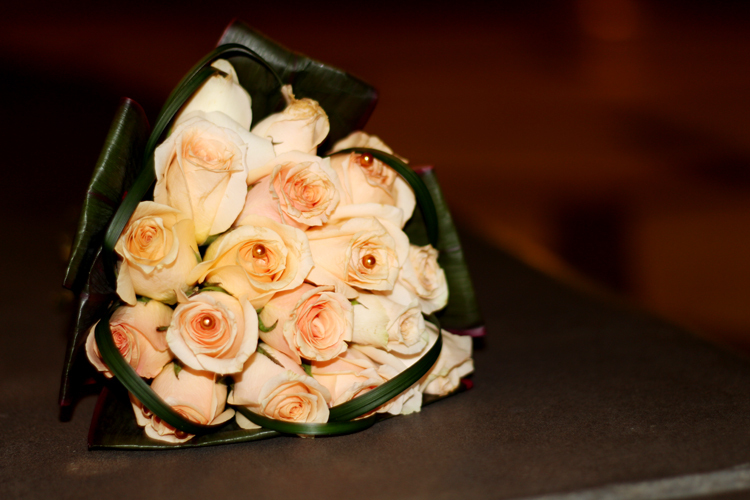 thank you nuerr <3 <3 So do you! I see your pictures all getting prettier by the day!! Great photo! I love this style! Very pretty. Love the dress. That dress is so nice. I like stripes. Have a nice day. Out of all the 'striped' looks that have bombarded the internet in the past month or so, yours is, by far, the best rendition. I love this dress, love how you've styled it! Look at the backpack and how adorable it is. Perfection. BTW, would you like to follow each other on bloglovin and such? Ahhh thank you dear for such a big compliment! It means a lot to me so thank you again :) I'd love for us to keep in touch! Wahhhh should have joined in to see weiwei and sylvie's shoot hahaha. Anyway this romper (and the angles kejun took the pictures at) made you look so tall!! Hahahaha it was a last minute decision to join in!! Nvm still will have alot of other chances to join in people's wedding shoots.. *ahem. Hahhaha and thanks for the compliment!! You really do look like you have super long legs with this dress, buahaha! Aww congratulations to your boyfriend's brother and his fiancee, it's so perfect to have wedding shots at Gardens By the Bay, I LOVE that place, it's so beautiful!! You and le boyfriend so romantic <33 Such a nice way to spend a day hehehe! Ahh thank you sweetie and for the compliment! That romper is stunning, but not as gorgeous as you and your bf! So cute! Hey Chris! Haven't seen you in a long time <3 Thanks for the comment! So beautiful photos!! And gorgeous dress! 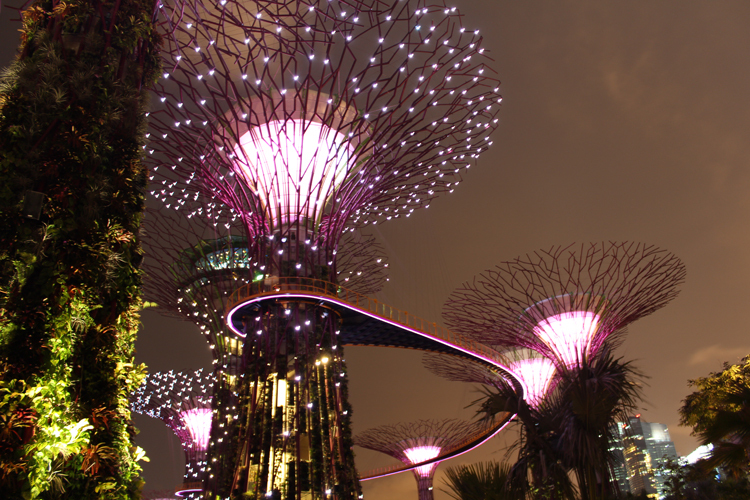 i always wanted to go to Gardens by the bay..
You can always drop by to Singapore during a festive or season break for a holiday! It will be summer all year round in Singapore! Hey hey dun need to feel 'guilty'. If so, i shud feel so too. :) Ure lookin as good as ever. Hope u had a great easter day . 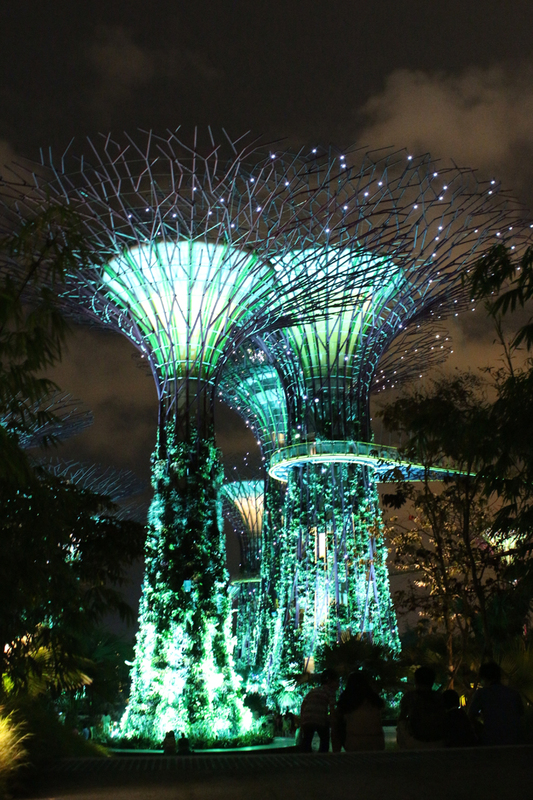 Beautiful coverage on gardens by the bay. u shud try the rooftop bar at indochine. its not bad a view too. if you have, good for u. That stripe dress was made for u. Hey Issa! Haha it's great to know someone who understands! And I hoped you had a great easter weekend too. I have never went to the rooftop bar though! I'll go check it out. Thanks for the recommendation! such a gorgeous dress and u look lovel!! so very nice! 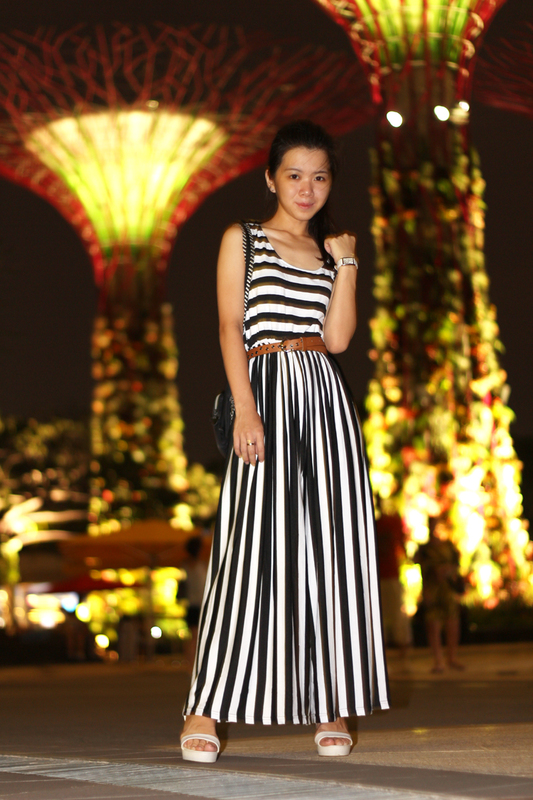 You look brilliant in that maxi stripy dress, i love it.